A consultation on the measure - introduced in the final months of the coalition - is to begin on Tuesday. David Cameron said the move would "pressure" firms into boosting women's wages, as he vows to eliminate the gender pay gap "within a generation". Labour welcomed the move, but said the government had been slow to act on pay transparency. In November last year, Office for National Statistics figures suggested that the gender pay gap was at its narrowest since comparative records began in 1997. The difference was 9.4% in April compared with 10% a year earlier. The coalition legislated in the last Parliament to require firms with more than 250 employees to publish the average pay of male and female employees - with the measures to be introduced in 12 months. The Liberal Democrats pushed for the policy at the time despite Conservative opposition - however, the Tories included mandatory equal pay reporting in their election manifesto. Confirming that the government would press ahead with the move, Mr Cameron said it would "cast sunlight on the discrepancies and create the pressure we need for change, driving women's wages up". Image caption Mr Cameron says the government wants to see a "higher-pay society"
A consultation will look at the detail of how the new gender pay gap regulations will be designed - including what, where and when information will be published. In a speech to business leaders in London, Mr Cameron said: "Paying men and women different amounts for doing the same job isn't entirely solved, but it's nearly solved. "The difference between pay for men and women doing different jobs is much more difficult to tackle, but we can do it with help from business." Writing in the Times ahead of his speech to business leaders, the PM said the new National Living Wage would also play an important role. "This will primarily help women, who tend to be in lower paid jobs," he said. 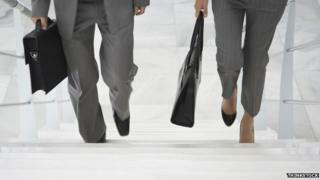 "It will help close the gender pay gap. "But we need to go further, and that's why introducing gender pay audits is so important." It comes as the government announces that a target of getting women into at least a quarter of boardroom seats at the UK's biggest firms by 2015 had been met. Lord Davies had set the target in 2011 after conducting a review into the gender balance on company boards. Speaking on BBC Radio 4's Today programme, Women and Equalities Minister Nicky Morgan said no final decision had been made on how companies should report the data. Mrs Morgan said the gender pay gap had "virtually been eliminated" for under 40s working full time. She appealed for a "real commitment" from business who she said could set their own targets. Mrs Morgan's opposition counterpart, Gloria De Piero, said it was "good news" ministers had "finally embraced pay transparency after shelving the Labour legislation for five years". But she added that an annual equal pay check to measure progress was needed for pay transparency to "make a real difference". Former Lib Dem equalities minister Jo Swinson said: "Saying we can afford to wait for another generation to close it is, to put it mildly, unambitious. "The UK economy is currently missing out on the talents of too many women. In government, my Lib Dem colleagues and I fought tooth and nail with the Conservatives to get them to agree to even minimal changes to help close the gender pay gap." Anne Francke, of the Chartered Management Institute, told the BBC the attempt to eliminate the pay gap was a "great, bold step" but warned that specific targets, not a blanket target, were needed. Confederation of British Industry deputy director-general Katja Hall said of the 25% target being met: "Businesses recognise the value of having a diverse board that reflects society and their customers. That is why we have reached this important milestone on time. "But we must not let our guard drop. Progress has relied on making sure new appointments are diverse, and this must continue." John Allen, chairman of the Federation of Small Businesses, said: "We need to keep up the momentum and break down the remaining barriers that prevent women progressing in the workplace and the boardroom".